When I was in Nashville this summer, I remember seeing a certain candy in all of the local shops. What was a Goo Goo Cluster, I wondered? When I found out it was made right in the area of Nashville where we were staying, it seemed like the perfect opportunity to check it out and sample the tasty treats. The Goo Goo Cluster is promoted as the nation's first combination candy. According to the people at Goo Goo, before 1912, candy was manufactured in bars only, consisting of one element, like chocolate. This concoction, the brain child of Howell Campbell, Sr. and Porter Moore, is made of caramel, nougat, and peanuts, and then draped in chocolate. In 1912, this combination did not fit the mold, literally. The Goo Goo timeline in its Nashville flagship. Because of their unique shape, Goo Goo Clusters used to be hand wrapped in tinfoil by the candy ladies. Today, automation allows for 20,000 wrapped clusters ever hour. Sorry, Lucy! As for the name, it took some time. It is said that Mr. Campbell, was chatting with fellow streetcar passengers on his way to work one day and mentioned that his son's first words were "Goo goo." A teacher, also riding on the streetcar told Campbell that Goo Goo should be the name of his new candy, because it was so good, people would ask for it from birth. And so began the Goo Goo Cluster. 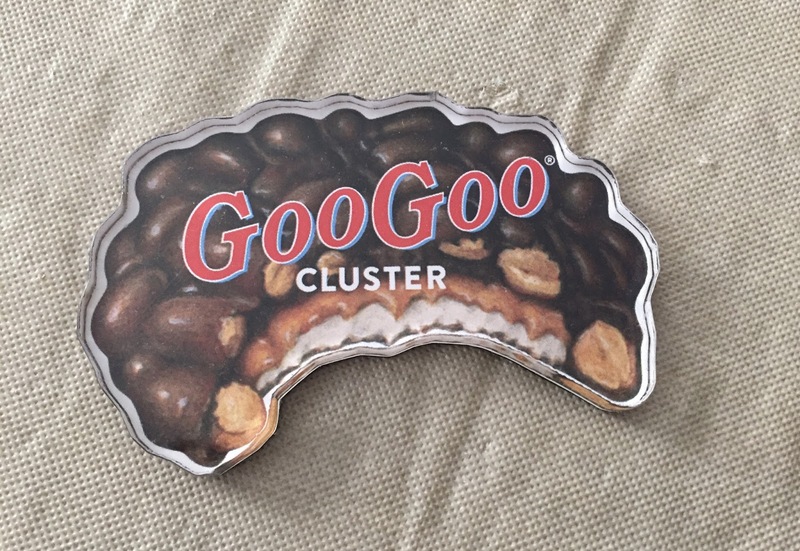 At the Nashville store, you can buy variations on the original Goo Goo Cluster, featuring unique small-batch combinations, or you can purchase boxes to take home with you, as well as nostalgic Goo Goo merchandise. The boxes come in the original combination, the Supreme, with pecans instead of peanuts, and with peanut butter, instead of nougat. I brought home the variety pack with all three. They're all fabulous. The Goo Goo store is located at 116 3rd Avenue, South in Nashville. Their telephone number is 615-490-6685. And if you're not in the Nashville area, you can order the sweet treats and merchandise online. The Goo Goo Cluster was a tasty surprise during my trip to Nashville. What is your favorite uniquely local treat you have tried while away for business or holiday? Yummm these things are so good. It must have been fun to see them get made! I love trying something local when I'm traveling! Never heard of the Goo Goo Cluster. Thanks for sharing. I just got back from Nashville too, and we saw Goo Goo Clusters everywhere! I had no idea that the factory is actually located in Nashville, so it's awesome that you got to visit! They look yummy, definitely trying them when i'm in the area.. were they expensive or average? These look so good! my favorite "local" treat used to be See's candy, but now you can find that anywhere. I have never heard of them but they sound really good! What a nice local treat. They're delicious and even better that they're made right in Nashville. See's candy...I am going to look those up. I have never heard of them. I love all things chocolate, so this was right up my alley. Have a great day, Lindsey. I think the box of 9 or 10 was about $9, so average, I think. Well worth it. They're delicious! What a fun city, isn't it, Ashley? I love all things chocolate, so these were right up my alley. I love all things chocolate, so these were right up my alley. I love all things chocolate, so this was right up my alley. I loved chatting with the staff about the history and seeing the specialty ones made. What a fun city, isn't it, Andrea? I love all things chocolate, so these were right up my alley. Love this! I have a friend from Nashville that I've met online, we have yet to meet in person, who sent me some Goo Goo Clusters in a care package:) They are delicious! Love this story Kelly! These look like a delicious treat, I would try the sampler as well. I have family in Nashville area maybe I'll be getting a box in the mail at Christmas! Those look AMAZING!!! It's all of my favorite things in one candy! I loved them. And I love that the city of Nashville supports this local business everywhere else in Nashville. Plant the seed, Peggy. They're sweet, but so good. Have a great weekend! They're so good. I love that the city of Nashville supports this local business everywhere else in Nashville. It's a win-win. Hmmmm.... You made my mouth water with this blog post :) I've never heard of Goo Goo Clusters, but they sure look good! Wow, thanks for introducing me to a Goo Goo Cluster! They look incredible!! They were a real treat and knowing they were a local business made it even sweeter.